Postcards, as we are familiar with them today, have taken a considerable amount of time to develop. First restricted by size, color, and other regulations, postcard production blossomed in the late 1800s and early 1900s. Postcards were popular because they were a quick and easy way for individuals to communicate with each other. “Deltiology,” or the collection of postcards, became a popular hobby. People became excited about the new social media craze, sending anywhere from one, two, three, four or more postcards a day to family and friends. The postcard is a format that dates to 1861, when Congress authorized privately printed cards weighing under one ounce to be sent through the mail. Entrepreneur John P. Charlton then copyrighted the world’s first postcard and marketed it as a way to stay in touch with family and a cheap means of advertising, all for half the cost of a letter. On May 12, 1873, the United States Government released the first official card. The words “Postal Card” were printed on its back along with a one-cent denomination. Only government issued cards were allowed to use in the words “Postal Card” by law. The side with postage was designated exclusively for the address, the other side for the message. Many of these blank cards were purchased in sheets by private firms who printed on their fronts. Privately printed cards were still allowed but they required two cents postage if they carried anything but advertising. This was the same as letter rate making these cards unpopular with the general public. Prior to 1893 these cards were primarily used for advertising with a rare few used as greeting cards. When an image of the Eiffel Tower was printed on a souvenir card from the Paris Exposition of 1889, it became the first true picture postcard and its popularity inspired other publishers to follow. The first known color postcard was also printed this year in Austria. By 1893 souvenir cards were issued on a large scale for the first time at Chicago’s Columbian Exposition. Their success inspired similar cards to be made for the many expositions that followed. The image usually took up a relatively small portion of the front to leave plenty of room to write a message. Montages of multiple scenes surrounded with decorative flourishes were very fashionable on both cards and illustrations of this period. A boom in the private printing of pictorial cards followed the 1893 Columbian Exposition. While they often contained the words” Correspondence Card,”” Mail Card”, or “Souvenir Card” on their backs, they are generally referred to as pioneer cards. There were no size requirements at this time so they appeared in many forms. Although these new cards showed much potential, their production was largely held back by a seven year depression. Adding to these troubles were postal regulations that set the standard mailing rate at one cent for both government and privately printed cards but added a penny surcharge on private cards alone if a message was written on them. This created much confusion and outrage as the rate for a more private letter was also two cents. The government was continuously lobbied to make reforms but no changes would come until the depression ended in 1898. While the use of cards in the United States progressed slowly through the 1890s, a postcard craze had begun in Europe during these same years. So many of these early vignette views were printed in Germany that they became generally known as “Gruss aus” cards. As the U.S. Government was tiring of the costs to produce postals, the popularity of exposition and souvenir cards enticed more publishers into the business. Eager to transfer the burden of card production, the government issued new postal regulations that ended its monopoly on the printing of postals, but the words “Private Mailing Card” –authorized by the Act of Congress on May 19, 1898—were required to be printed on the back of all cards not issued by the government. Starting on July 1, 1898 postcards could be sent through the mail for only one cent regardless of whether they contained a message or not, but publishers had to contend with many size, color, and printing requirements. These restrictions forced many publishers out of the market, but the lower rates made these cards very popular, and many others began to publish them. During this time, postcards proved to be so popular that publishers all over the country were emboldened to issue views featuring large cities, historic landmarks, popular vacation spots and local scenes. During the heyday of the postcard craze, people bought them for the simple pleasure of owning them, and preserved the cards carefully into albums or posted them to family and friends with the expectation of receiving many in return. Photographs were occasionally sent through the mail as handmade cards in the 19th century, but the first real photo postcard was sent through the U.S. mail in 1899. All but the most important photographs would be shot in the postcard format as folks shared photos of themselves and their loved ones to others. With the new postal regulations of December 24, 1901, the words “Post Card” replaced Private Mailing Card on the backs of privately made cards. Government issued cards would retain the title of Postal though the public would soon use both interchangeably. Previous size and color restrictions were also relaxed. As the images gracing the front of cards grew larger and increased in quality, they began to be purchased largely for their pictorial value. Only a small border tab, usually along the bottom or side, remained next to the image to write a message. Many of the names that would rise to importance in postcard publishing were in business by 1903. J. B. Hoffman of Harrisburg found a niche offering postcards of places Pennsylvania residents would recognize. Hoffman chose subjects that were surprisingly mundane—train stations, grocery stores, movies theaters, parks, and buildings such as the state capitol and churches. Postcards were the way folks loved showing others their new found modernity and affluence. To keep in step with Europe, the United States released new postal regulations on March 3, 1907 that divided the back of postcards in half, the left side for a message, the right for postage and address. This date is often referred to as the birth of the modern postcard for it created the same format we use today. The most obvious effect of this new measure is that it allowed an image to take up the entire front of a card. What ultimately killed the postcard craze was World War I. Further restrictions on the use of raw materials would curtail postcard production after the United States entered the war in 1917. A penny war tax placed on postcard postage helped to drive down its use. While postcards were still produced to keep up morale and to serve as instruments of propaganda, many printers closed due to shortages and lack of manpower. Quality cards were still being produced in Europe long after they began to decline in the United States, but the Golden Age of Postcards had come to an end before the war was over. 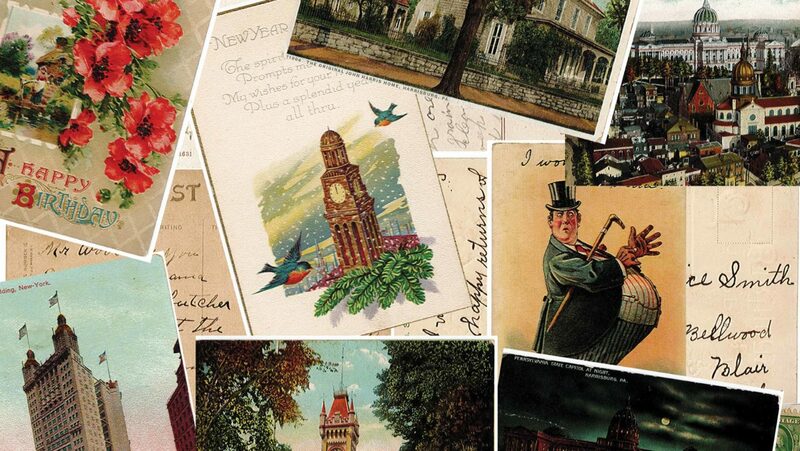 What did people scribble on those postcards so popular a century ago? Nothing much. “Wish you were here,” was very common. Here are some examples of postcards sent and the messages written a long time ago.